My husbands aunt received this as a wedding present 54yrs ago, from his GGM. Thank you for Looking. I have no idea but just wanted to say it's beautiful! All that work by hand just amazes me. You are very lucky to have it! It's beautiful and I love the handwork but as usual, I'm not help with names of quilts. except it looks like your vintage photo blocks were put together without the corner squares and without sashing. What a treasure, it is beautiful!!! Love it..whatever the name is. That is a beautiful quilt!! I am not sure, but sure is a beauty!!! Very beautiful!! You are so lucky! WOW, I guess I was wrong. My books are packed for my move in less than two weeiks. I thought it was a broken star !! I think it is Carpenter's star. 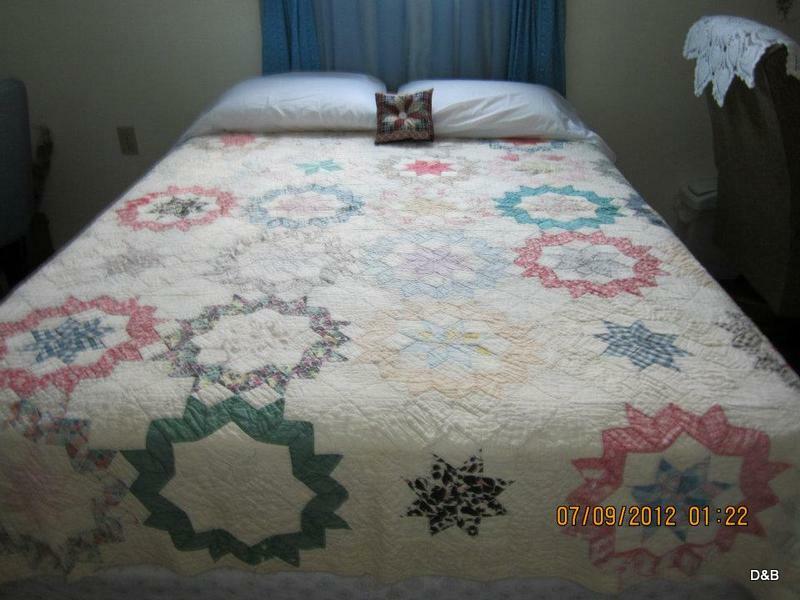 What a beautiful quilt it is, and the design is timeless! What a perfect quilt. Love all the colors and it looks so soft and cuddly. What a wonderful treasure. Thanks for sharing. Absolutely gorgeous! 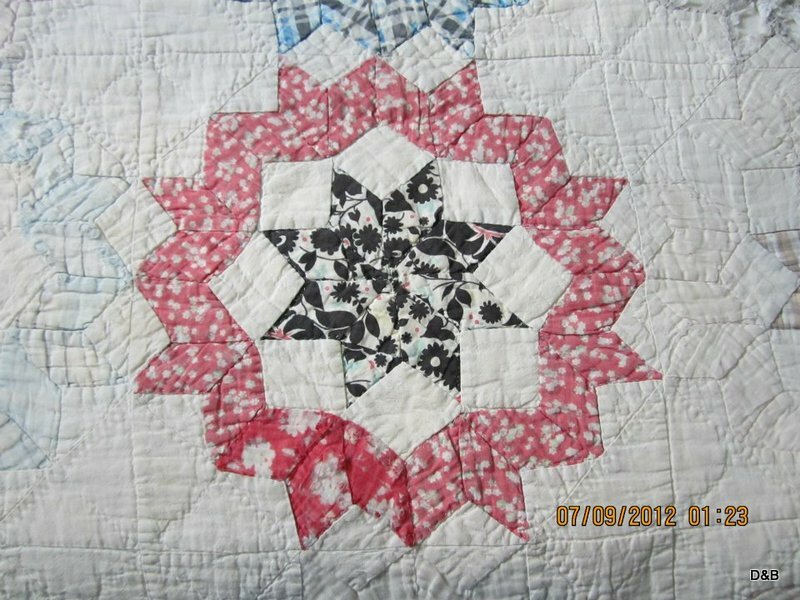 I love old quilts!! It's beautiful! 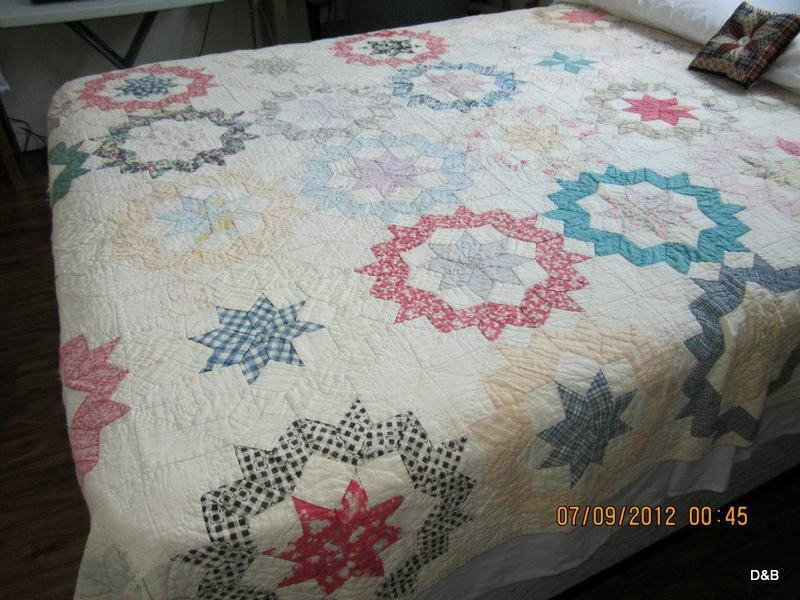 her quilting was also beautiful! I saw a Carpenter's Wheel that looks similar. But I'm not good at describing some patterns. What a prize quilt you have there. Something to really cherish. I love it. It is beautiful. You can tell it has been well taken care of. it's all in diamonds. I would love to know the real name of this. beautiful. True looks like a variation on carpenter!s wheel, but there is also something called "swoon block", but I think it has more pieces and is larger, not sure...just enjoy the treasure!